Young handsome man sitting outside in the city cafe and holding smartphone. Male drinking coffee in the evening. Young handsome man sitting outside in the city cafe and holding smartphone. 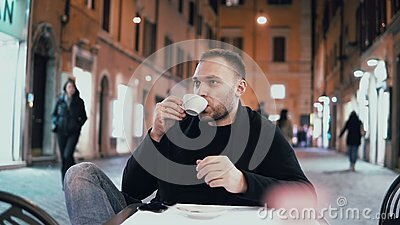 Attractive male drinking coffee in the evening in downtown alone. Guy spending time behind a cup of coffee.